After 8 years, the final (201)4/3/21 countdown. The Dongdaemun Design Plaza and Park will be inaugurated on March 21, 2014, but I had the pleasure to visit it last month with new friends*. 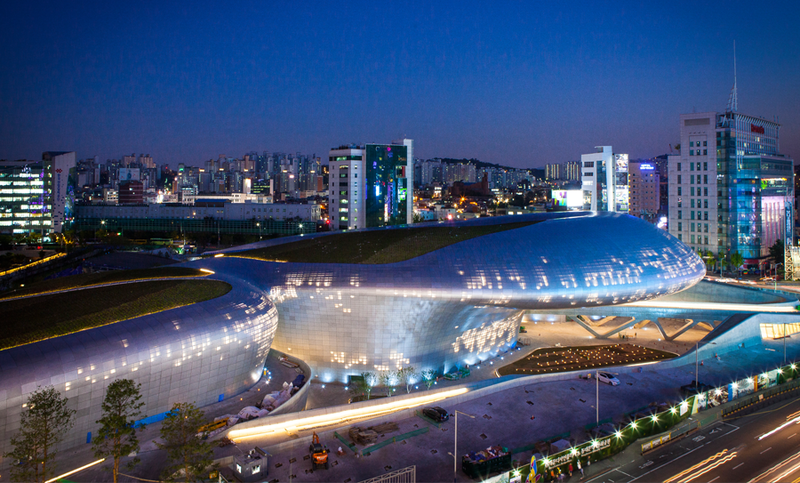 A perfect occasion to challenge my initial impressions of Seoul's newest landmark. As you know (see links at the end of this post), said "initial impressions" were not so positive. 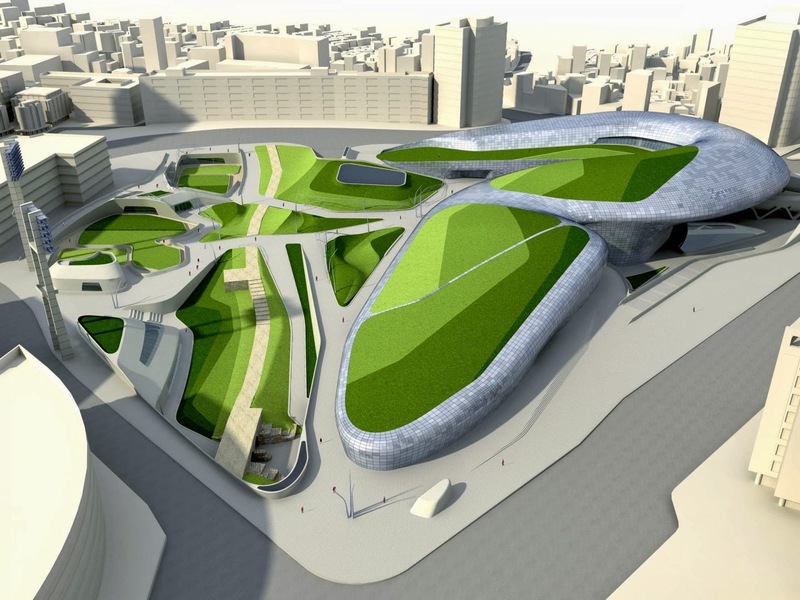 Yet I was ready to change my mind, and happily looking forward to discovering Zaha Hadid's work from the inside. 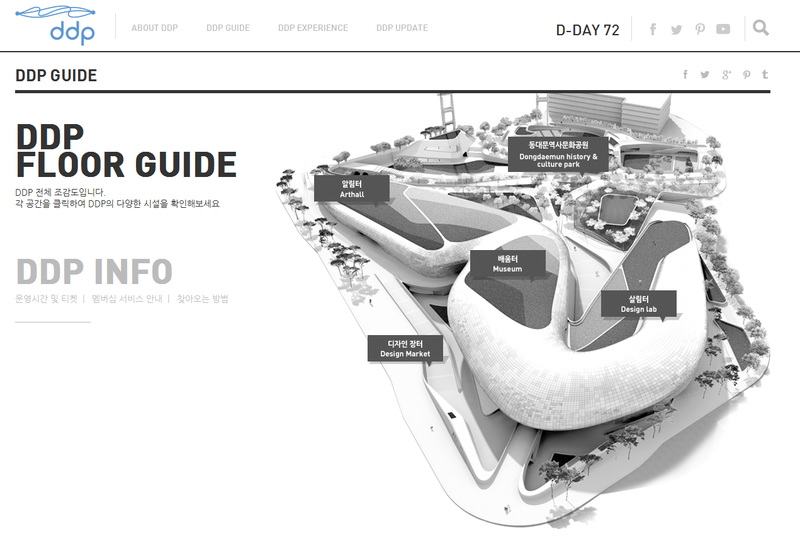 To put it bluntly, at the beginning, I was not convinced by the project selected by then Mayor OH Se-hoon, consistent with his grand World Design City Seoul 2010 vision that would also give us such architectural wonders as a Tsunami City Hall** or the unthinkable yet not unsinkable Seoul Floating Island. Obviously, OH tended to confuse "Design City" with "spectacular displays of design for design's sake across the city", adding a very personal definition to the word "design" itself (who cares about the function anyway). "(NB: about the old stadium) The green giant remained as an embarrassing dinosaur miraculously forsaken by evolution. 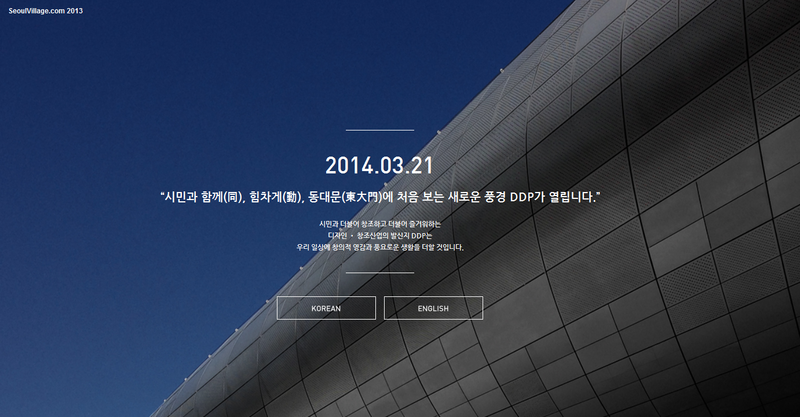 Dongdaemun Design Plaza (DDP) may well become the next generation embarrassing green dinosaur. I like the idea of bringing disruption, and there is an interesting organic touch to the main building... but instead of environmental friendliness, it evokes (judging by the models at least) a plastic toy or one of the countless attractions recently built in minor league cities pretending to play in major leagues. To me, the gizmo already looks obsolete." When I wrote these waspish lines, I had Frank Gehry's Guggenheim Bilbao in mind: cities struggling to catch attention? hiring superstar architects more known for spectacular protuberances than for discretion? letting them freely play around with their software, without many editorial constraints? ending up with the empty shell of cultural alibis, waiting to be filled with limited resources already stretched beyond their limits?... At least the actual client, Guggenheim, knew a thing or two about design and architecture. And their Bilbao franchise was not centrally located, but in an urban dead-end. Frank(gehri)ly, the result is by no means a sore sight for eyes, but a spectacular venue deliberately put on a pedestal more than a part of the urban continuum. Speaking of urban continuity... I was also thinking about Paris' Forum des Halles: a 63,000 m² project is more about urbanism than about architecture, and you want to make sure that city respiration is improved by it, not cut. Here, to me, the risk was limited to the big question mark, and more precisely the question-mark-shaped main structure: won't this long, intimidating wall with few openings block the view at street level, preventing a dialog with half the neighborhood? The big question mark: will the DDP successfully dialog with its surroundings? This is certainly not Les Halles and East 1er Arrondissement, and the situation can only improve from the car-centric mess I've always known, even when street vendors occupied much of the streets. The new complex is overwhelmingly low-rise and car-free and that's a very good thing, even if the promenade to the East - elegantly sloped - could be lined up with more trees or natural protections from the killer waves of Seoul's summer heats and winter winds. The western front (Art Hall, Museum) looks a bit overwhelming from across the street: you can't see beyond the giant wave except at the central opening, and you can't see the underground spaces that make the structure much lighter and open. Pedestrian flows do look more fluid from this angle. The giant ojingeo by night,flashing its colorful lights. So, how was it inside? Somehow, I felt at the same time drawn further inside, and kept outside. A foreign contaminant tolerated behind the pod bay doors, fearing the moment when the suave voice of HAL9000 would resonate: "I'm sorry Steve, I'm afraid I can't do that". 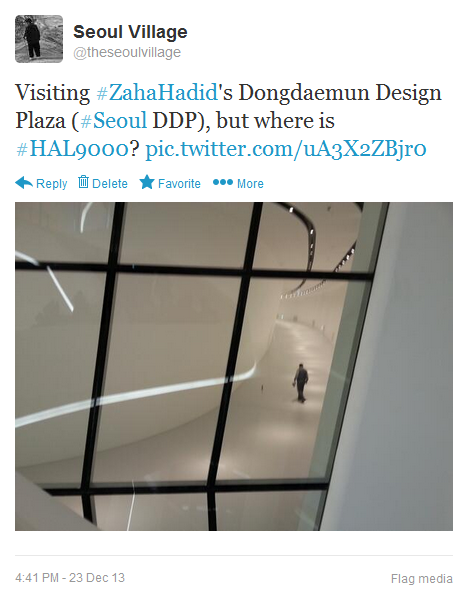 Visiting #ZahaHadid's Dongdaemun Design Plaza (#Seoul DDP), but where is #HAL9000? If the purpose is to showcase the power of sheer design, I guess this does the trick. Humans shall eventually find ways of fitting in. "Here comes the sun" (September 2012) - on Seoul's green rooftops, including the DDP's. 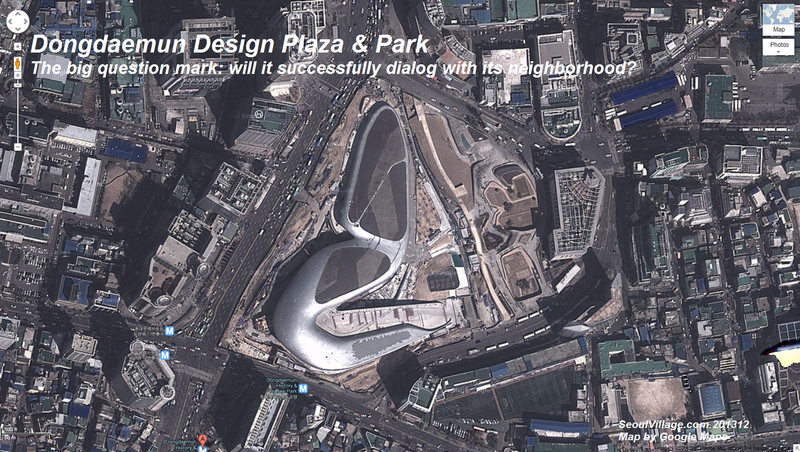 "Buldozing Seoul, again - Dongdaemun Design Plaza, New City Hall" (September 2008) - on the DDP's planned obsolescence. ** see for instance "Seoul Old Towns or New Human Towns? New City Hall or Tsunamheat Wave? ", following "Seoul Tsunami City Hall, The Other Korean Wave"
*** which, again, I was not too sad to see removed. The sad part was how Cheonggyecheon and Dongdaemun merchants were treated by Mayor LEE Myung-bak (from Cheonggyecheon to Pungmul Market), and his successor (from the old soccer stadium to the Seoul Folk Flea Market in Sinseol-dong).